This effective learning workshop deals with the traditional student problems: too much to read, how to remember what has been learned in class or from readings, how to prepare for projects, assignments and tests. It proposes that the solutions to these problems lie in simple techniques that enable students to be self-directed, collaborative and efficient in their learning. 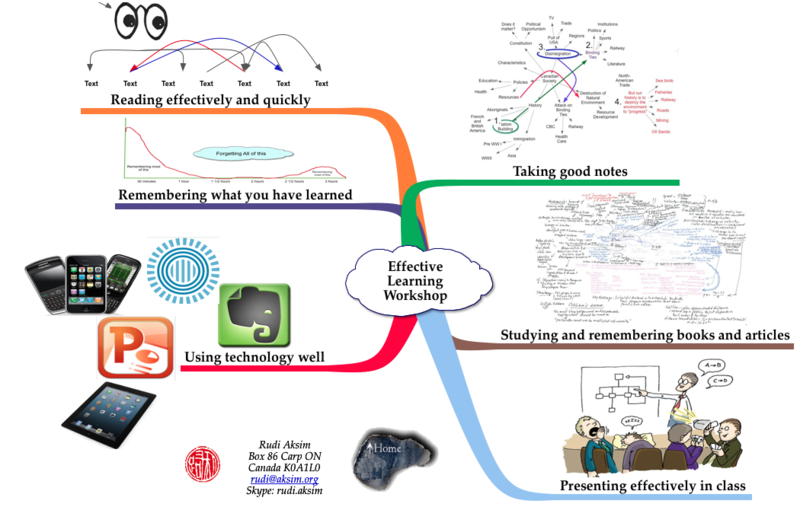 Built around the use of Evernote, a free cloud-based note-taking tool, this workshop explores reading, memory and note-taking fundamentals and uses a scenario-based approach to find straightforward, practical solutions to the kinds of problems that all students encounter in modern post-secondary institutions. The workshop is offered in a number of formats, sometimes as one 6-hour session or two 3-hour sessions. A practical handout supports each of the topics below. The interactive delivery of the workshop fosters social learning skills: teamwork, leadership and presentation skills. Learners need to bring their laptops, cellphones and tablets (if they have them) to this workshop.